Polystyrene capacitors are used within a limited number of applications. Polystyrene capacitor construction does not lend itself to surface mount technology and accordingly polystyrene capacitors tend to be used for leaded applications. 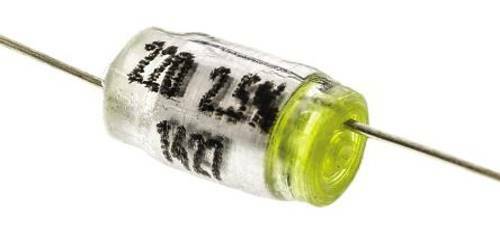 As a result of their construction and limited use, these capacitors are not widely used these days and can sometimes be difficult to source. 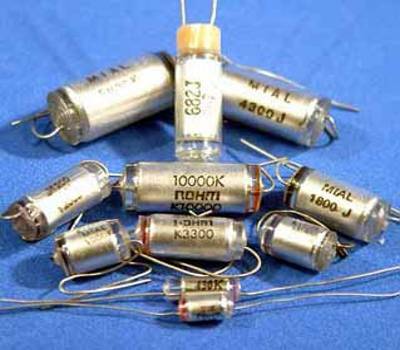 Polystyrene capacitors are not widely available these days, however, they still find applications within audio circles. This is as a result of their electrical characteristics which lend them to these applications. The polystyrene capacitors provide a number of electrical characteristics which make them suitable for a number of applications. These capacitors provide high insulation, low leakage, low dielectric absorption, low distortion and excellent temperature stability. In view of their properties, rhese capacitors can often be used in place of silver mica or ceramic disc capacitors. Polystyrene capacitors are capacitors that have a dielectric made up of polystyrene. They come only in low values, usually 10pF to 47nF. Normally, their tolerance is 5% to 10% but high precision capacitors are also available with tolerances of 1% and 2%. Working voltages for these capacitors are 30V to 630V. They have a high negative temperature coefficient of -125 parts per million per degree Celsius. They are used in coupling and storage applications due to a high isolation resistance. The precision types are suitable for timing, tuning and filter circuits. They are constructed like a coil inside, so they are not suitable for high-frequency applications. A note worth noting is that polystyrene capacitors exhibit a permanent change in value should they ever be exposed to temperatures much over 70°C; they do not return to their old value upon cooling.